A loan of $3,200 helped a member to purchase new clothing. This community bank is called Todos Juntos. It is made up of 18 entrepreneurs who work in different sectors, including coal sales, textiles, clothing sales, painting, and others. All of the members live in the city of Valdivia. Yeisi is a member of the community bank. In the photo, she is in the back, and you can only see her smiling face. She has a hairstyle to the side. She works selling clothing. She started selling second-hand clothes two years ago, however two months ago, she began selling new clothing. She already has a large number of customers thanks to her past jobs. Her schedule is flexible, which allows her to organize her own day. Her merchandise is made in the city of Santiago, specifically in the Meiggs neighborhood, an area that provides products to merchants at a low cost. With this loan, she will invest in her business and purchase new clothing. Her goal is to have an established store for her business so that she can stock up on new designs. Yeisi lives with her mother and her two daughters, who are 3 and 10 years old. Her dream on a personal level is to provide her daughters with a quality education so that they can be professionals. She is very happy and thankful for the loans and services provided by Fondo Esperanza. She comments that she feels very comfortable with the members of the community bank and the meetings given by them. Valdivia is a city in the south of Chile, located in the Los Rios region. It is known for having one of the few navigable rivers in Chile, the Calle Calle. Valdivia's main economic activities are shipbuilding, lumber, paper, cellulose (Celco), brewing, and milling. Tourism also plays an important role, as does university educational services, headed by the Universidad Austral de Chile. Translated from Spanish by Kiva volunteer Eileen Lloyd. View original language description. Este Banco comunal se llama “Todos Juntos”, está conformado por 18 emprendedores que se dedican a diferentes rubros entre los cuales se encuentran, ventas de carbón, tejidos, venta de ropa, pintores, entre otros. Todos ellos pertenecientes a la ciudad de Valdivia. 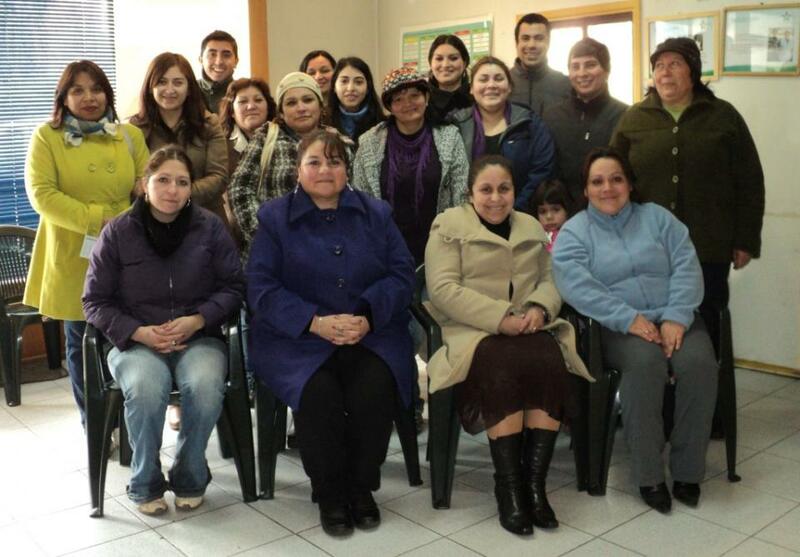 Yeisi integrante del Banco comunal, quien en la foto se encuentra al fondo del grupo y solo se puede apreciar su rostro sonriente, usa un corte de cabello hacia el lado. Ella se dedica a la venta de ropa, comenzó vendiendo ropa de segunda mano desde hace dos años, sin embargo en la actualidad y desde hace dos meses está incursionando con la venta de ropa nueva. Comenta que ha alcanzado tener un gran número de clientes, debido a sus trabajos anteriores de manera dependiente. Su horario de trabajo es flexible, lo que le permite coordinar su día de manera organizada. Su mercadería la encarga a la ciudad de Santiago, específicamente en el barrio Meiggs, sector que surte de productos a comerciantes con un bajo costo. Con el crédito invertirá en su negocio y comprará ropa nueva. Sus metas son instalar su negocio en un local establecido, ya que esto le permitiría abastecer con novedosos diseños su negocio. Yeisi vive junto a su madre y sus dos hijas de 10 y 3 años de edad. Sus sueños a nivel personal son proporcionarles a sus hijas una educación de calidad y que puedan ser profesionales. Ella está muy contenta y agradecida con los créditos y servicios brindados por Fondo esperanza. Comenta que se siente muy cómoda con el grupo del Banco comunal y reuniones impartidas en éstas. Valdivia es una ciudad del sur de Chile, ubicada en la región de Los Ríos. Se destaca por tener uno de los pocos ríos navegables de Chile, el Calle Calle. Valdivia presenta, dentro de sus principales actividades económicas, la industria de la construcción naval, maderera, papelera, celulosa (Celco), cervecera y molinera. El turismo desempeña un papel importante, como también los servicios educacionales universitarios, encabezados por la Universidad Austral de Chile. Fondo Esperanza (FE) is a private non-profit organization that supports entrepreneurship by providing micro-credit and training to people living in poverty in well over 100 cities throughout Chile. By providing these services, FE aims to improve the living conditions of the entrepreneurs and their families. In 2010, FE provided loans to more than 41,000 entrepreneurs. It utilizes a communal banking model in which groups of 18 to 25 clients meet on regularly and guarantee each other’s loans. The members use their portion of the loan to create or expand their own businesses. In the group meetings, clients receive training though the FE Entrepreneurship School, which enhances clients’ personal and business skills and ability to work in groups. While Chile is on the verge of being considered a developed country, it’s also home to dramatic inequalities. A significant – though less visible – portion of the population cannot access formal financial services. As the largest and most highly-regarded NGO in Chilean microfinance, Fondo Esperanza is one of the few lending institutions serving Chile’s informal business sector with small loans. However, the high operating costs associated with offering small loans in a relatively developed country make it difficult for FE to achieve sustainability. Interest-free Kiva funding helps FE move toward self-sufficiency while maintaining its strong focus on social performance and serving marginalized populations.